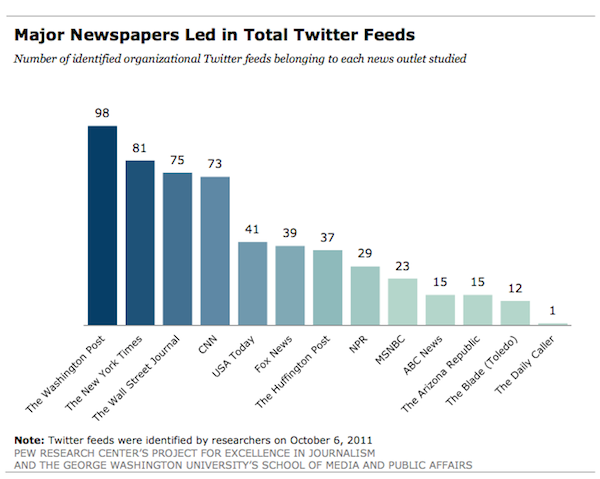 A new Pew study finds news outlets using Twitter almost exclusively for one-way distribution — of their own content. Fully 93 percent of the postings over the course of the week offered a link to a news story on the organization’s own website. There are some caveats here, the main one being that 13 isn’t, in the scheme of things, a huge sample, particularly given the many discrepancies between news outlets’ sizes and shapes. (The study examined 37 different Twitter feeds across the organizations it examined — the main institutional feeds, as well as breakout accounts — for a total of 3,646 individual tweets.) 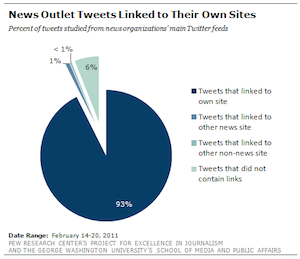 The findings are also based on a single week of Twitter usage — the week of February 14, 2011, to be exact — chosen, the report explains, because “it resembled a typical news week, as opposed to one absorbed with a major breaking news event.” And while most major news orgs have adopted social media strategies that have resulted in general week-over-week regularity when it comes to the number and type of tweets they post, tweets are still, ultimately, like the news itself: ad hoc, responsive to external events, and, therefore, subject to change. A week-o-tweets can definitely be revealing; it’s not, however, terribly conclusive. Because of that, the report’s findings should be read less as sweeping determinations about news outlets’ Twitter practices and more as a revealing analysis of a particular, Twitterfied moment in time. “More than 98 percent of the tweets studied from The New York Times, The Washington Post, USA Today, The Huffington Post, The Daily Caller and NPR included links” [i.e., were spreaders of content, rather than conveyers of simple conversation]. Less than 1 percent of the tweets from The New York Times, 3 percent from The Washington Post, and 3 percent from The Huffington Post solicited information. Of course, “this is not to say that news organizations are not tapping into public sentiment on Twitter through other means. News staff may well be reading, even sometimes doing so on air, the comments posted by their followers. And reporters may have their own list of Twitter feeds that they check regularly,” the study notes. I’d suspect that’s correct. Still, though, from the perspective of the dichotomy between the journalist and the journalistic institution…it’s remarkable how conservatively organizations and individuals alike seem to be availing themselves of the opportunities Twitter offers. And it’s worth wondering whether news outlets’ need to be institutional is hampering their ability to be, also, conversational. The outlets that, within Pew’s sample, exhibited the most obvious indicators of audience engagement — active solicitations for information, the use of hashtags to convene and reach out to particular communities, and the like — are also the smaller outlets, and/or the outlets with a more explicitly political orientation. While 1 percent of The New York Times’ tweets aimed to gather information from followers during the week studied, 21 percent of Fox News’ tweets did. And while 2 percent of The New York Times’ tweets used hashtags that week, 50 percent of Fox News’ tweets did. That’s not to say that the NYT should become more like the FNC; it is to say, though, that the Times might be missing something by not being more Fox-like. One of the hallmarks of our digital tools is their ability not only to connect people with other people, but also to connect people with organizations — and, ideally, vice versa. While news outlets are right to be strategic in their approaches to social media, it’d be great to see them thinking a little less about distribution…and a little more about conversation. Garber, Megan. "Twitter, the conversation-enabler? Actually, most news orgs use the service as a glorified RSS feed." Nieman Journalism Lab. Nieman Foundation for Journalism at Harvard, 14 Nov. 2011. Web. 25 Apr. 2019. Garber, Megan. "Twitter, the conversation-enabler? Actually, most news orgs use the service as a glorified RSS feed." Nieman Journalism Lab. Last modified November 14, 2011. Accessed April 25, 2019. https://www.niemanlab.org/2011/11/twitter-the-conversation-enabler-actually-most-news-orgs-use-the-service-as-a-glorified-rss-feed/.